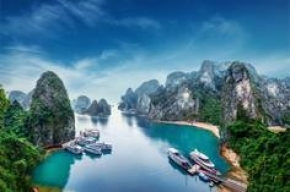 Háº¡ Long Bay which literally means descending dragon bay is a UNESCO World Heritage Site, and a popular travel destination, in Quáº£ng Ninh Province, Vietnam. The islands vary greatly in size and shape as well as structure. Spend your nights at Hanoi Imperial and enjoy the great service provided by the staff there. Take a tour with Marguerite Junk Cruise to explore the beautiful Ha Long Bay and get the experience of a lifetime!